Smart and supportive Emily French is a dedicated teacher for all of the children in Alder Gulch, Montana. Unbeknownst to most people in the town, she is feeling rather lonesome. All of her siblings have gotten married and gone off to have adventures of their own in California or back home in her native Boston, but she lives in Montana with their parents. One day, Fate intervenes and she crosses paths with a handsome young miner by the name of Nick Ascot. His friendly charm leads her to invite him to dinner with her family that very night. She soon finds that she has quite a lot in common with Mr. Ascot, but there’s one problem… As they walk along the road together one afternoon, she reveals that she is a teacher and his face grows pale and he ends their time together abruptly and runs home. When she later attempts to confront him, she is met with silence until he finally confides that he had a bad experience with his classmates when he was a child. Is their friendship and potential relationship forever doomed or can she find a way to help him heal from the trauma that he endured as a child? 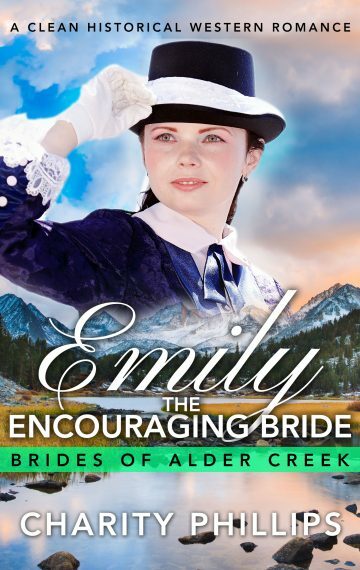 Emily: The Encouraging Bride is a standalone 20,000 word clean historical Western romance.